About 20% of dog owners will recognize these symptoms: head shaking, ear scratching, face rubbing, itchy skin, chewing at paws, and licking, licking, licking – all of it accompanied by the irritating jangle of metal dog tags, day and night. Those 20% have pets with allergies, otherwise known as atopy, or atopic dermatitis. Allergies are triggered by environmental irritants such as pollen, mold, or dust mites. Pollen allergies occur seasonally. Although a dog’s symptoms can be severe, they’re usually pretty well controlled with a combination of cortisone (steroids), topical medications, essential fatty acids, and antihistamines. Pooches who are sensitive to molds and dust mites aren’t so lucky. Their symptoms can last for months, or even year-round, because molds and mites are in your home all the time, even if you are a fabulous housekeeper. Giving steroids year-round can have profound negative health effects and isn’t recommended. Up until about 10 years ago, immunotherapy (allergy shots) was the most effective long-term treatment for the year-round itcher. Then a drug call Atopica (generic name cyclosporine) was approved by the FDA and provided another good treatment option. Cyclosporine is an immunosuppressive drug. The dose we give to dogs has been proven to be generally safe, especially because we try to adjust the dose to the lowest effective level. Although Atopica is said to relieve itching in 74% of patients, there are some side effects, such as vomiting and loss of appetite. My personal experience has been that it seems to stop working in some dogs. I’ve heard dermatologists at national meetings praise Atopica but also admit that it isn’t the panacea for allergic dogs that they had hoped for. But now there’s a new player on the market: Apoquel. When allergens such as pollen and mold enter the body, they cause immune cells to release chemicals called cytokines. These cytokines cause inflammation and itching. Apoquel specifically inhibits cytokines to help stop itching, with minimal negative impact on immune function. Our clients notice a beneficial effect within a week of starting Apoquel, but it takes about four weeks to get the best effect. As with any drug (especially new ones) there are some restrictions mandated by the FDA: Apoquel can’t be used in dogs younger than 12 months old, or in dogs that have cancer, serious infections, or other severe conditions. So far, it hasn’t been approved for use with steroids, and it shouldn’t be given to pregnant or dogs used for breeding. So far the most common side effects we’ve seen are vomiting and diarrhea, but those seem to be infrequent. Now for the frustrating bit: The popularity of Apoquel wasn’t anticipated by its maker, Zoetis, and the supply is running low. The veterinary community is irked by this; it’s reminiscent of the late, great Steve Jobs creating fervor over the newest Apple innovation and then making consumers wait months to buy it! After all the exaggerated promises made about Atopica when it first came on the market, most veterinarians have approached Apoquel with cautious optimism. We’re finding that Apoquel isn’t a quick fix for the chronic allergic dog, but it’s a very good tool to add to our allergy arsenal. It seems that most cat people have their own favorite type of kitty litter and box, as do I. (In a past blog, I extolled the virtues of the Breeze Litter System.) But wouldn’t it be great to do away with the litter box altogether? Not only is kitty litter bulky and heavy, it’s also expensive. The cost of litter for one cat averages $150 per year, and you have to make frequent trips to the store to buy it and haul it home. Then you have to scoop one or more litter boxes every day and find a way to dispose of the soiled litter. Most cat litter is not biodegradable, and each year millions of tons of it end up in landfills. It’s not hygienic for cats to tromp around in their dirty litter box and then jump on your counters, furniture, and bed. Litter scatter is a nuisance. And the odor — need I say more? When I got my first cat, a Persian named Shad, the idea of eliminating the litter box intrigued me, so I trained him to use the toilet. There was no Internet back then to guide me, nor did I use a book. But it turns out that the method I used is very similar to those proposed by modern-day cat training gurus. Your cat should be 6 months old or older. Cats that have arthritis or balance problems, that are overweight or that are in poor health won’t be able to jump on the toilet seat safely. Leave their litter box on the floor, preferably in a spot that is accessible without navigating stairs. Do not try to toilet train a cat who isn’t reliably litter trained. It’s not essential, but it’s helpful to have an extra bathroom that humans don’t need to use, with a door that’s left open. You have to be willing to always keep the toilet lid up. But if you want to use the toilet yourself during the training period, simply remove the temporary litter pan described below and replace it when you’re done. If you have a traditional hard toilet seat, consider replacing it with a soft padded one. Many years ago I used a soft plastic bowl for training, but I recently learned about a better method that uses a disposable aluminum roasting pan. A pan measuring around 12” x 9” x 2 ½” should fit snugly inside your toilet bowl. Find a flushable litter (BetterWay Flushable is an example) and slowly replace your cat’s regular litter over about a week. Once he’s used to the new litter, you’re ready to start. 1. Move the litter box next to the toilet, with the toilet lid up. Once the cat is used to using it there, gradually raise the box a couple of inches every day by putting it on a stable surface: a stack of newspapers, for example. Eventually you’ll notice that he jumps onto the toilet seat and then into the litter box. When the litter box is level with the toilet, move it directly on top of the seat. Make sure it doesn’t slip — use duct tape if you must. 2. Now throw those newspapers or boxes out, put away the litter box, and lift up the toilet seat. You’re ready to fit the aluminum roasting pan snugly into the toilet bowl, crimping it to fit. Place about one inch of litter in the pan, and lower the seat on top of it. Use pressure to flatten the aluminum edges. 3. The next steps involve getting your kitty used to seeing the water in the bowl. You’ll need to cut a series of holes in the aluminum pan. Cut a 1”-by-1” X-shape in the bottom of the pan toward the rear of the toilet, bend the flaps up, and then roll each flap down. This will form a hole with raised rolled edges, like a dam, which will keep most of the litter in the pan. When your cat gets used to seeing the water through the hole, enlarge it inch by inch from side to side across the toilet bowl. Keep cutting and folding the excess aluminum to retain the litter. How often you do this depends on how well your cat adjusts to the open water. As soon as he seems comfortable with each size hole, make it a little bigger. 4. Continue to enlarge the hole gradually until only one inch of litter is showing around the edges of your aluminum dam. At some point, your cat will learn to put all four paws on the toilet seat to eliminate. Remove the pan — you’re done! Just remember to flush the toilet once or twice a day. You already know that you can teach your dog a plethora of cool tricks and commands, but give your kitty some credit; He or she can learn a few tricks, too. 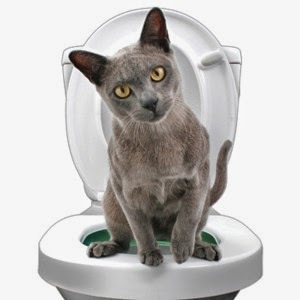 For a neater, less malodorous home and cleaner cat paws, give toilet training a try. And don’t forget: bathroom door open, toilet lid up! More detailed instructions can be found in The Toilet Trained Cat by Aston Lau. Interested in owning this book? Become a follower on my Google+page. If you’re the first person to follow and email me (mmcculloughdvm@gmail.com), I’ll send you a free copy. I presented a Pup-Peroni in the exam room to Pebbles, an aging Labrador retriever, and watched her thrust herself with sliding paws to an upright position, her eyes bright with gustatory anticipation. I do so love this breed -- they’re so easy to please! If we’re lucky dog owners, eventually we’ll be dealing with a senior pet like Pebbles. Almost all older dogs get stiff and arthritic. But larger breeds can have a particularly difficult time getting up from a lying position and navigating slippery floors and stairs, even when they are on a good arthritic drug regimen. I turned to Patti Triola of Dogs in Motion for an expert opinion about products for dogs with mobility problems. Patti started out as a physical therapist for humans; eventually, she decided dogs were her first love and became a certified canine rehabilitation therapist (the doggy equivalent of a physical therapist). Patti has helped many dogs recover from injuries and surgery, and she has worked with many arthritic geriatric dogs. I asked her to focus on the needs of stiff older dogs who are afraid of falling or who have trouble getting up. Some owners of senior pets have their own problems with strength and mobility, so picking up their dog, or carrying it upstairs, isn’t a good option. But help is on the way! 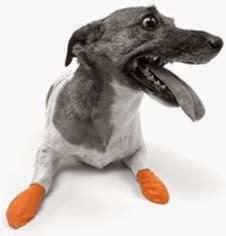 Triola suggests trying booties to give your dog better traction. One example is Pawz, a rubberized bootie that is disposable and reusable. For more comfort, buy a size larger and put a soft sock on each paw first. She also suggests Muttsox,which are soft and have a nonstick surface on the bottom. The best product Patti turned us on to is the Help ‘em Up Harness, an underutilized little miracle. Hind-end weakness causes a dog to pull itself up with the front legs, which puts stress on the back, shoulders and elbows. With the Help ‘em Up Harness, you use handles positioned over the dog’s shoulders and hips to help your pal get up from the floor, climb the stairs or get into or out of the car. The harness stays on during the day or when you feel it’s needed the most. 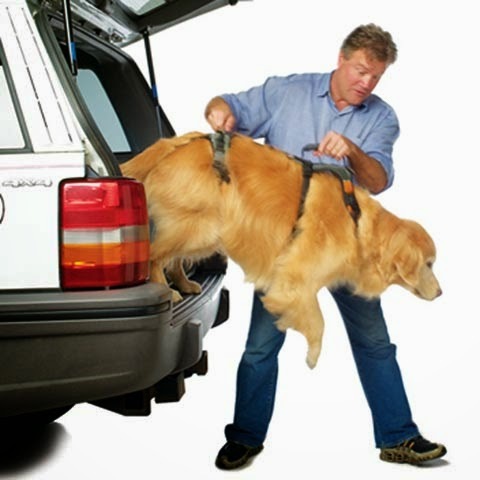 If you’ve discovered something that’s been a big help for your pet’s mobility, e-mail me: mmcculloughdvm@gmail.com. Your experience is our most valuable resource.